Today is beautiful: sky a warm clear blue, air rocking gently in the slightest of breezes. This is spring here at its best, all soft edges and softer light. We have had precious few of these so far, and we shall not have many more for some time yet; already the forecast predicts the more usual high winds, with snow to follow late next week. In this place, winter takes its leave grudgingly. We have been lucky thus far, cold or no. The trickster winds of spring are what make this season hardest: When they blow at a speed of fifty miles an hour, gusts far higher, it’s a battle merely to remain upright. There’s no room left for thought; all resources turn toward getting through the gale. This week will see us riding out gales of many sorts — the sort of days when we can hardly remember that there are friendly winds, too. Occasionally, more tangible reminders are required, a means to focus our thoughts on the good yet to come. The Four Winds move and shape our world, within the storm and without. In this cuff, Wings honors their elemental power with this return to one of his own informal signature series and an old classic, traditional Native style of silverwork. It begins with a beautifully simple band of heavy, solid nine-gauge sterling silver, hammered by hand on both sides in the old way, with hundreds of strikes of a silversmith’s hammer, to create a spectacularly refractive surface. On the inner band, a long line of directional arrows traces the length of the center, some consecutive, others reversed, still others pointing outside their slender line, representing the wind’s own changes of direction, sometimes capricious, sometimes intentional. 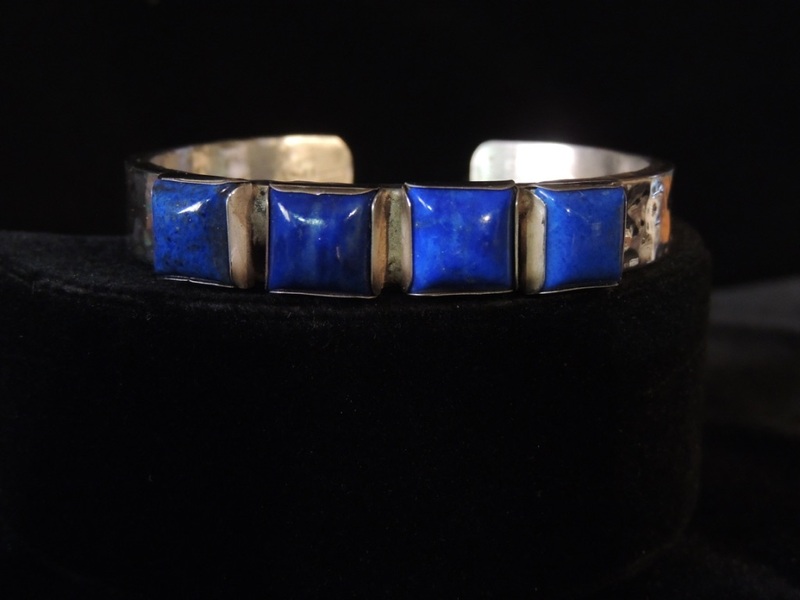 On the band’s surface, its sole adornment consists of four square bezel-set lapis lazuli cabochons set next to each other at the center, each stone lightly domed and the brilliant cobalt blue of deep waters and stormy skies, each represent one of the winds of the Four Sacred Directions. Ends and edges are all filed by hand, with each end rounded and smoothed, also by hand, for comfort. 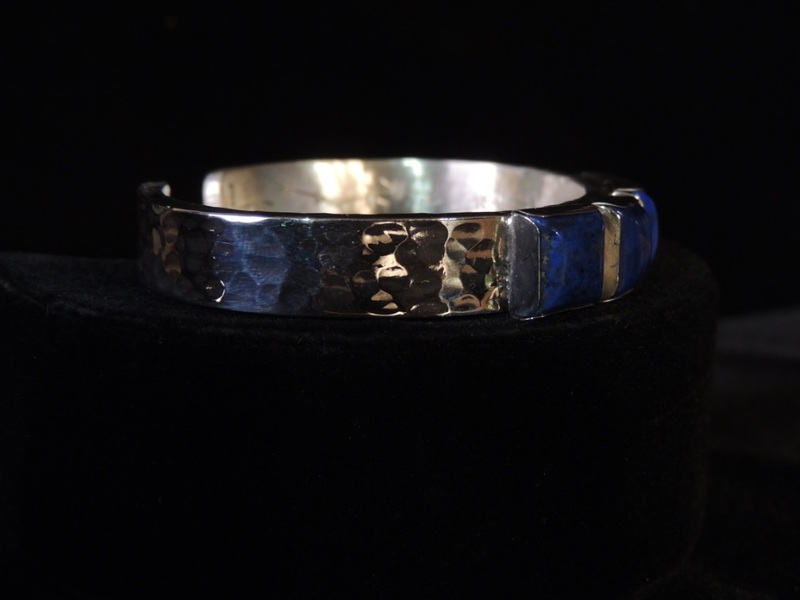 The band is 6″ long and 6/16″ across; each lapis cabochon is 6/16″ square (dimensions approximate). Side views and a view of the inner band shown below. What makes this piece, to my mind, is the interplay of storm and light, of the blues of sky and the hammered silver of the waters. Lapis lazuli is, within its small spectrum, a widely variable stone, ranging from grays with only the faintest hint of blue to violet so deep as to be nearly midnight. And while “color analysts” place blues squarely within the “cool” category, lapis in its indigo shades, like that found here, seems warm indeed — those of summer skies, of warming winds and waters. We shall not have such warmth today, although there is a chance of reaching seventy. But warmth is relative. After a dawn below the freezing mark, frost crisping the grass and slicking the flat surfaces, even our current middling temperatures feel positively balmy. And as difficult as this week and the next (and perhaps some weeks after that) may prove to be, we know that the gale will be succeeded by gentler winds, ushering in a season of a warm clear blue. Posted on Sunday, April 7th, 2019 at 11:02 am. Filed under: The NDN Silver Blog Tags: The NDN Silver Blog	RSS 2.0 feed.